A Thought: Creating. It was late in the evening. 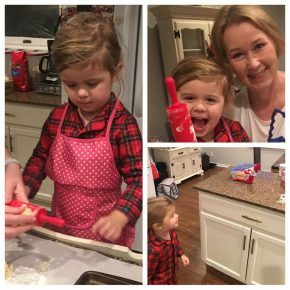 Pajamas and apron were on. It didn’t matter. A promise was kept. Cookies were created. Smiles surfaced and laughter bubbled up. Even, “Charming,” the elf, got in on the act and Laine Austin spied him the next morning with his hands literally in the cookie jar! What promise do you need to keep? What will you create today? Christmas is coming. Jesus is coming. Create a Spirit of Christmas beginning in your heart!